This is a Triple Feature review. Three totally opposite movies. Always entertaining to create an afternoon or late-night Movie Marathon of many different genera of films. Twilight Time always brings out a vast variety of films and this month is a prime example of that reality. First up in this triple movie thon is a film that seems totally odd for a Twilight Time choice. But all the same it’s a wonderful product. 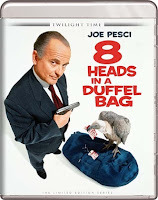 Twilight Time always brings out high class products and 8 Heads in a Duffel Bag is another prime example of a wonderful transfer to 1080p High Definition Blu-ray. Starring one of my favorite actors. He can do comedy and he can do serious and brutal. His dramatic acting alongside his comical acting showcases just how brilliant he is as a performer. From the masterpiece Goodfellas, Casino, Raging Bull to the comical banter of Home Alone, My Cousin Vinny he is truly a gifted performer and is never a blah moment to his mastery. 8 Heads is not one of his great films, and it’s not a great film, but is one to be entertained by its dark comical reality. A wonderful Blu-ray flawlessly done by Twilight Time. Well this stars the one and only master voice talent singer, icon and ultimate legend in the music world Elvis Presley. Now I am not a huge fan of Elvis as an actor. Never really cared for his movies, but there are two or three that I consider greats and Flaming Star and Kid Galahad is two of them that I do love and both have been honored with a Twilight Time Blu-ray release. Many people believe Flaming Star is his best performance and I cannot disagree with that. He had a talent that transcended the music world but never really got the chance to show his shinning colors because he was always type cast, as the singer or the cute boy after the girls. Also starring the one and only Charles Bronson. Charles Bronson is my boy. One of my all-time favorite tough guys. I am a huge Charles Bronson fan. My favorite will always be, the Death Wish saga. I own every one of his films on VHS, and DVD, and now many of his films are coming out, or have already came out on Blu-ray. Bronson came from a time of cinema when, Manly men owned the camera. The tough guy persona ruled, and operated a no holds bar attitude of dominance in film. There was a time when the male figure demonstrated a control of the character they were playing. Now days the white ghost teeth, slick hair, metrosexual, male figure becomes somewhat laughable in cinema, compared to the brutes of men in the 40’s, all the way to early 90’s cinema. What happened to the days of the sophisticated tough guys, like, Richard Burton, Yul Brynner, James Cagney, James Coburn, Bronson, Eastwood, Hackman, Lee Marvin, Gary Cooper. How Hollywood has missed the mark in not creating the tough guy persona, just amazes me in all its stupidity. Don’t get me wrong there are still tough guys, but the style, and approach has changed. The original tough guys did not have to demand your attention, they already had your attention, and Charles Bronson was that style. Directed by a classic director Phil Karlson who gave us so many wonders such as Kansas City Confidential, Hell to Eternity, The Silencers, Hornet’s Nest, Ben, Walking Tall. Just a wonderful director that created many styles of films. Kid Galahad is one of those films that stands out and thankfully Twilight Time has honored this director with a wonderful Blu-ray. 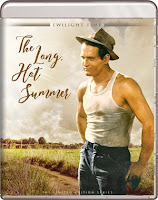 Next up is my favorite of the triple feature 1958’s The Long, Hot Summer starring a wonderful cast of performers. The one and only Orson Welles master at everything. The pure Hollywood handsome, golden boy Paul Newman. Also starring the amazing, talented and utterly beautiful, and might I add, the very definition of performance, Angela Lansbury. Lansbury is a pure god of cinema. Simply point, an acting genius. The truly gifted goddess, Joanne Woodward. Also starring the very beautiful actress Lee Remick. Remick was a powerful performer. It’s hard to believe she died so young, 55 years old was way too young. She was a goddess of cinema. Her beauty and art form of acting stands out brightly for the viewer. I will always remember her in the horror classic 1976’s The Omen. This was directed by a truly wonderful director that we lost in 1990, Martin Ritt, he was truly a gifted man. A playwright, an actor but most of all a director is what he's remembered for. He mastered such greats as HUD, The Spy Who Came in from the Cold, The Great White Hope, Sounder, Norma Rae, among many priceless others. What’s interesting is he directed the 1964 film The Outrage which is the American retelling of the classic masterpiece of Kurosawa's Rashomon. Sadly, that crazy house of un-American activities committee in the 1950's started looking at this wonderful director and he became blacklisted by supporting supposedly the Communist Party. This was during a time that too many wonderful directors, actors, got that tag and destroyed them because of the stupidity of these lynch mob type people. He was blacklisted from television, he was not able to do anything on television again because of that blacklisting and so he returned to theater. Thankfully after the stupidity of the red scare movement in Hollywood which started to die down he could direct again. When he started out directing again, his first film directed was 1957's The Edge of the City which is an amazing film and after that he would go on to direct many, many more, including this film I am reviewing. Now interesting is he directed 1976's The Front starring Woody Allen. This was the first feature film to talk about the blacklist. It was about how people would put their names on blacklisted writer’s screenplays so that the movies could be made. All three of these films on Blu-ray have never looked any better. The quality of product shines with perfection that Twilight Time so lovingly creates. All three films are crisp is sound and vibrant in imagery. 3 perfected Blu-rays. Isolated Music & Effects Track: Jeff Alexander had a wonderful career in both film and TV. Working on such greats like many Elvis Presley films like, 1957’s Jailhouse Rock, 1962’s Kid Galahad, 1967’s Double Trouble, 1967’s Clambake, 1968’s Speedway, among many others. He not only was a composer, but an author, conductor and arranger of music. 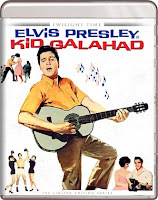 His work on the many Elvis Presley films stands out, and Kid Galahad is memorable. Isolated Music Track: Alex North was a genius of music. He crafted such greats and memorable music moments in countless brilliant films. From the amazing masterpiece Spartacus, Viva Zapata? Who’s Afraid of Virginia Woolf, A Street Car Named Desire and so many others. It was truly fantastic to experience this special feature. As I have stated many times before, this is one feature I always look forward to. These are brought out by Twilight Time Special Edition 3,000 Unit Blu-rays. They have done it once again in creating a masterful print and masterful audio for all three films. Some wonderful and truly amazing products to own for its crystal clarity in image and sound. Twilight Time Blu-ray’s should be owned by everyone. Twilight Time does such a fantastic job in isolating the music track and creating it beautifully on Blu-ray. All three are worthy to praise in the 1080p High Definition department.